Getting this up a little early, since I'm going to the sci-fi marathon starting at noon. Looks like a pretty good one, with only Transformers as a major stinker and three premieres, though of direct-to-video features. (The ticket will probably show up on next week's TWIT, unless I decide to bail in the next hour or so). Another quiet week. As we ramp up to the Oscars, there's not a whole lot of new stuff out that looks worth seeing. Hopefully that will improve soon. Back in '96, when I was working more hours at the now-shuttered Showcase Cinemas Downtown Worcester than I was studying computer science at Worcester Polytechnic Institute, Bound was one of the movies playing there, at least for a week or two. I must have been more dilligent about my studies than usual that week, because I remember being darn amused by "f___in' dark in here!" but not actually seeing the movie later. I'm not sure why it took me this long to catch up with it. Happily, it holds up. Between the Matrix films and Speed Racer, it's sort of become a footnote in the Wachowskis' joint career, but it's a real blast to watch. I got the same impression from it that I got from Midnight Meat Train last summer - the movies aren't really similar in any way, other than the fact that the directors of each knew that this was their calling card, their make-or-break moment, and they were determined that every instant be one that potentially sticks in the audience's memory. Bound is lurid pulp, but wonderfully so, a hugely entertaining twist on film noir roles. I'm glad I finally saw it. Here's another one I never got around to - the Brattle had a William Friedkin series or double-feature a couple years ago, but the movie was scheduled for 10pm and they had print problems, so it had to be shown off DVD, which at the time looked pretty lousy there. I conked out sometime early. It turns out to be a kind of nasty bit of work, a hard-R combination of action movie and police procedural, with Secret Service agent Richard Chance (William Petersen) obsessively chasing down master counterfeiter Rick Masters (Willem Dafoe). As one might expect, Friedkin throws one spectacular chase sequence in. He's great at getting the violence to jolt as well as titillate. One thing that I always notice about these 70s/80s crime movies by the likes of Friedkin, Frankenheimer, and company is just how sparse they are. "Chance hunts down Masters" is pretty much the entire story, whereas later everything would get a lot more complicated: There'd be a half-dozen twists and turns, and as many progressively bigger action set pieces. Here, we spend a lot of time just watching Chance and Masters, even though they're not particularly complex characters or undergoing much in the way of personal transformation. It's an action movie that somehow becomes an actor's showcase. 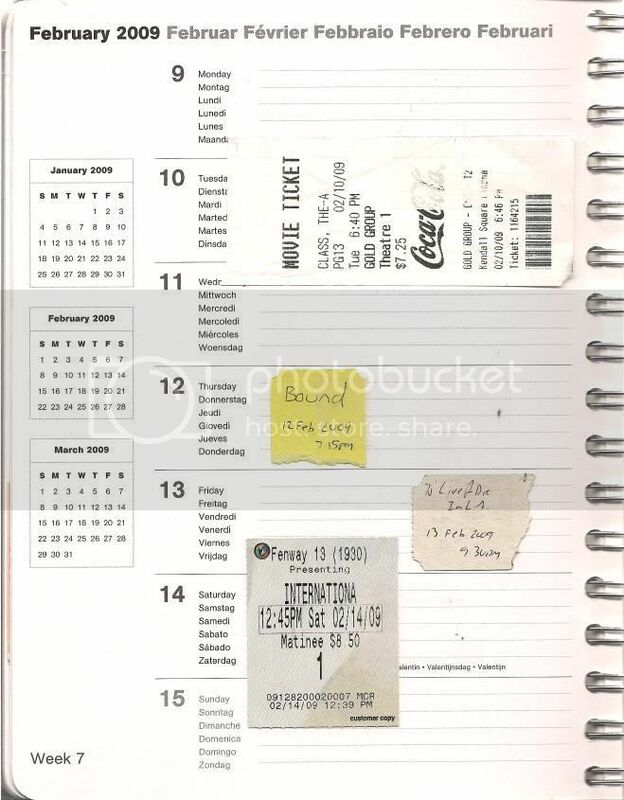 As you can see from looking at the page of tickets, The International ran me $8.50 for a matinee. There's an action sequence in the middle that's worth $4 or $5 of that, a running gunfight through New York's Guggenheim Museum that is absolutely jaw-dropping, both for the amount of ordinance expended and how clealry director Tom Tykwer stages it - no obfuscating editing or bad shot selection here; you know exactly what's going on. It's a tour de force of action filmmaking, something you'd expect to see from Johnnie To or John Woo on their best days. Does the rest of the movie make up the difference? I'm not quite sure. It's frequently very dry, with lots of talk about what the various agencies are investigating the bank for and jurisdictional infighting. But it's also got Armin Mueller-Stahl as the bank's military consultant, and while it seems like a bit of wasted casting at the start, it certainly isn't by the end, especially when he has a nice, long sit-down with Clive Owen's character to talk about ideals and how circumstances cause one to fall short of them.